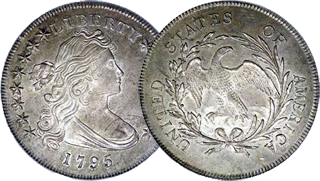 The Draped Bust silver dollar coin was minted from 1795 to 1803, and again into the 1850s. In 1804, coinage of silver dollars was halted; the last date used during regular mint production was 1803. In 1834, silver dollar production was temporarily restarted to supply a diplomatic mission to Asia with a special set of proof coins. Officials mistakenly believed that dollars had last been minted with the date 1804, prompting them to use that date rather than the date in which the coins were actually struck. A limited number of 1804 dollars were struck by the Mint in later years, and they remain rare and valuable.